Millions of Indian mobile phones with no valid unique identification code have been blocked for security reasons. The International Mobile Equipment Identity (IMEI) number is a 15-digit code which appears on the operator's network whenever a call is made. The absence of this number makes it impossible to trace either the caller or the phone or to access call details. Indian intelligence agencies say phones without the code have been used in attacks by militant groups. Mobile phones without the code were blocked at midnight - operators were asked to bar calls to them "in the wake of increased threat perception from militants". It is estimated that India has more than 25 million phones without codes. Phones with no codes or invalid numbers are mostly cheap, unbranded phones. Millions are manufactured in India or imported, mostly from China. Correspondents say these phones are popular because they are usually much cheaper than the branded ones. Many phone subscribers said they were being wrongly penalised because they were not aware that every handset had to have a code. The Cellular Operators' Association of India has asked the government to extend the deadline for blocking the numbers so that it can install identity numbers on unbranded devices. According to estimates by the Indian Cellular Association, unbranded phones account for nearly 30% of all sales in India. 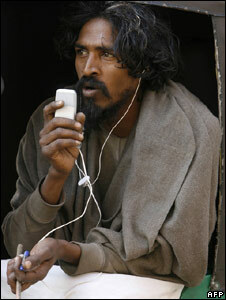 India has the fastest growing mobile phone market in the world, with more than 488 million subscribers.